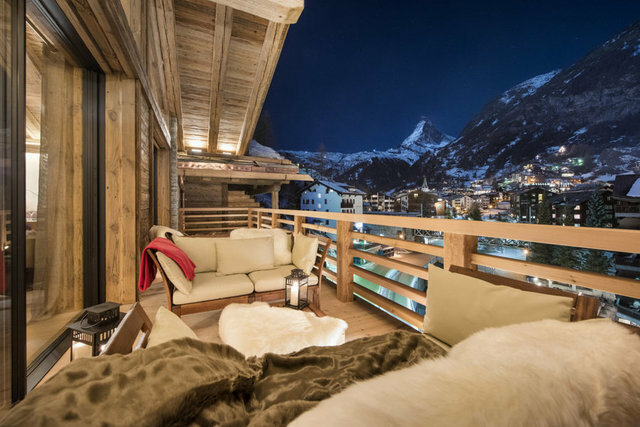 Completed in 2015, this luxury ski chalet is one of the most prestigious addresses in the center of Zermatt. Combined with striking views of the Matterhorn and south west facing balconies, it is a truly desirable location in immediate proximity to the shopping, night life and the main railway station. The Sunnegga funicular is only a short walk from the chalet and brings you directly up to the ski slopes. On entering the 567m2 chalet and leaving your skis & boots in your private ski room, the elevator conveys you up through the property set out over five floors. The comfortable open plan living and dining area with a central fireplace and high old wood beamed ceilings is located on the top floor. Picture windows open onto the generous balcony and frame the bewitching panoramic views beyond. In addition to the open plan kitchen with a breakfast counter in the living room, the chalet also has a private professional kitchen in the basement where the staff prepare the meals. Then in the back of the house you have your very own private spa with a large indoor hot tub and a sauna. Sleeping 12 people in five luxurious bedrooms there are two master double bedrooms on the second floor of the property with floor to ceiling windows and access to a large balcony from where you're in a perfect position to observe the village life. The main master bedroom has a big dressing area and an ensuite bathroom and the other master bedroom has an ensuite shower room. The first floor is home to three further bedrooms; two twin bedrooms with ensuite shower rooms and a bunk room sleeping four with an ensuite shower room as well. All the bedrooms have flat screen TV's and integrated sound systems. On the same floor you have a small but exquisite home cinema with a surround system and different light scenes.